Today marks the end of a long journey for me and the development team, as we get to launch the latest version of our flagship 3D reverse engineering and polygon modeling software, Geomagic Studio 2012 (note: technically, it is the thirteenth edition of the product, but for obvious reasons, we chose not to call it version 13!). After over a year of design and development, I am particularly proud to release this edition to our customers, as it contains some real noteworthy improvements, many of which are the result of hard work and long hours. One of te overarching themes of our Beta feedback was that this new version "just feels faster". Well, that's because it is! We increased the speed of processing by employing more multi-threading, while also allowing the system to use more points and polygons. The net result is anywhere from 30% to as much as 90% improvement in processing time and capacity (actual mileage may vary). Go ahead...throw some large data at it. Let me know your opinion. 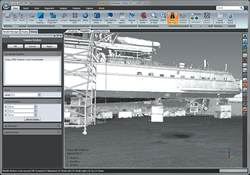 Since one of the real growth areas of 3D scanning is the long-range scanning market (i.e. Surphaser, Leica HDS, Faro Focus, etc), we focused on doing a better job of importing and filtering these large data sets. A key addition was a new Walk Through mode which lets the user "see" the data from the perspective of the scanner, and move through the scene, which makes editing that much easier. Now, you can view the data, chop out some interesting portions and make a sketch through it in CAD in a matter of minutes. Nice. Last but not least, I ask you...no, I order you to try out the Patch tool. This is one of those "why didn't we think of this before" tools that is unique to Geomagic and is getting rave reviews from our testers. Sort of a mashup of hole filling, Rewrap and smoothing, it lets you use geometry from a similar area of the polygon mesh to fill a hole. Since a lot of objects that are scanned have repetitive features (heck, a cube has 8 corners), all you need is good scan data on one of them, and you "patch" missing areas using this new tool. Oh yeah, and it will deform the patch to fit the area perfectly. Very nice. I hope you enjoy Geomagic Studio 2012. It represents alot of hard work, and is based, once again, primarily on feedback from our users. Now, I gotta get back to work...version 2013 already seems right around the corner! Download a free trial of Geomagic Studio 2012 now.